Transnet SOC Ltd is a public company (constituted in terms of the Legal Succession to the South African Transport Services Act, No 9 of 1989), with the South African Government as the sole Shareholder. 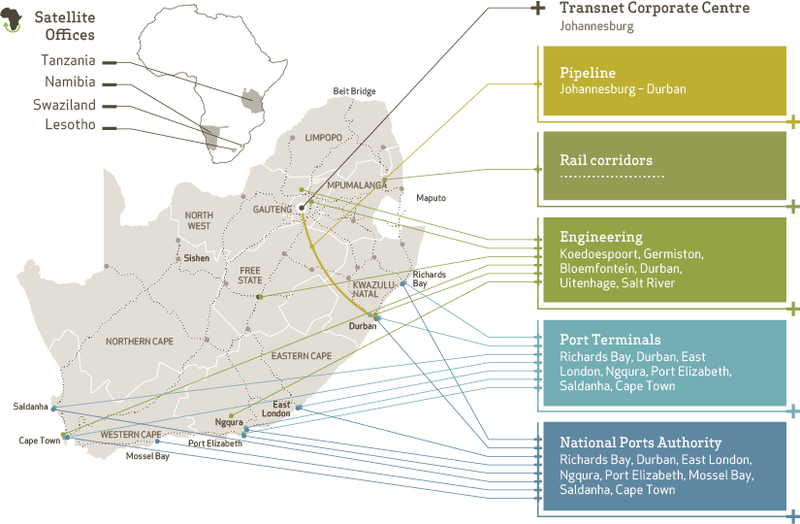 Transnet is the owner of South Africa's railway, ports and pipelines infrastructure. The Company's Memorandum of Incorporation – approved by the Shareholder Minister on 25 June 2013 – aligns with the provisions of the Public Finance Management Act (PFMA), the Companies Act and the National Ports Act, No 12 of 2005, as amended (the National Ports Act). As a state-owned company (SOC), the PFMA serves as Transnet's primary legislation. Transnet signs an annual Shareholder's Compact with the Government of South Africa, represented by the Minister of Public Enterprises. The Shareholder's Compact mandates the Company to deliver on numerous strategic deliverables, including sustainable economic, social and environmental outcomes. The Board directs the Company's strategy in response to the Statement of Strategic intent. Transnet's B-BBEE verification covers six of the seven elements of the Generic Transport Public Sector Scorecard (excluding the ownership element). The Maritime, Property and Rail Charters are also applied. Transnet achieved the full points for enterprise development and socio-economic development for the 2018 financial year. 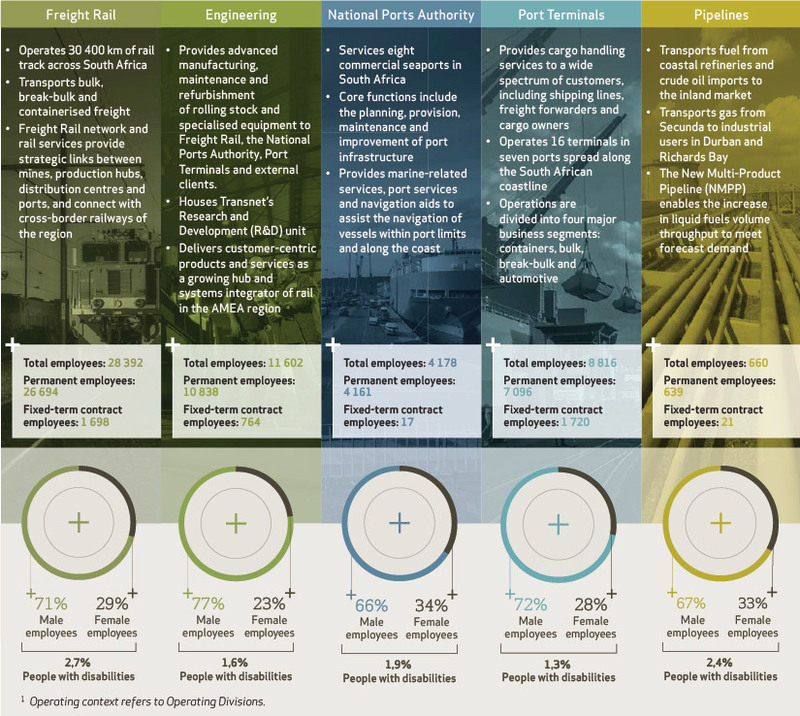 The post-MDS Transnet 4.0 strategic blueprint will address and maximise the scores for employment equity, preferential procurement and skills development. 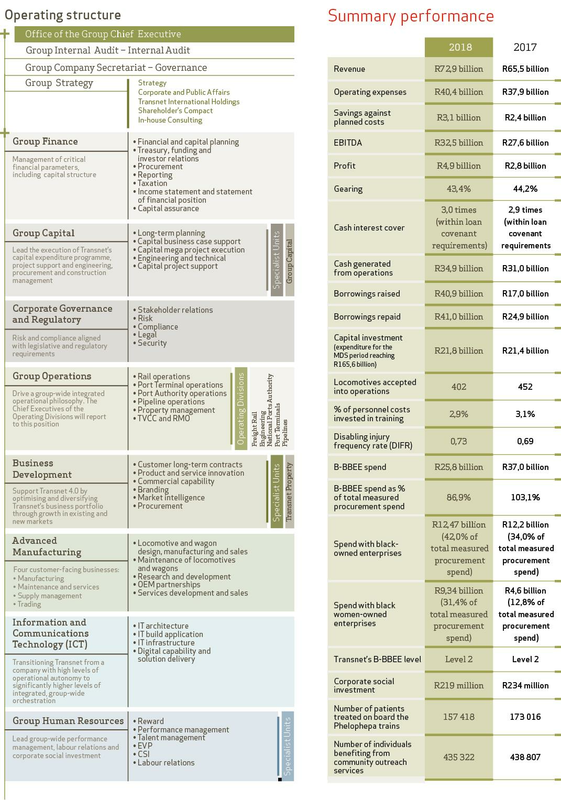 'Common purpose' technology platforms for SMME collaboration (tools and templates). As Transnet expands regionally, we will spearhead regional supply-chain opportunities for South African-based SMMEs and expand Transnet’s Enterprise and Supplier Development Strategy to support regional supplier development in countries where we operate. Our integrated Enterprise and Supplier Development Strategy supports the rise of young black entrepreneurs through the various developmental levels – from high-school innovation programmes through business case development and business incubation to our Black Industrialist Programme and our regional and global exporting and trade programmes. 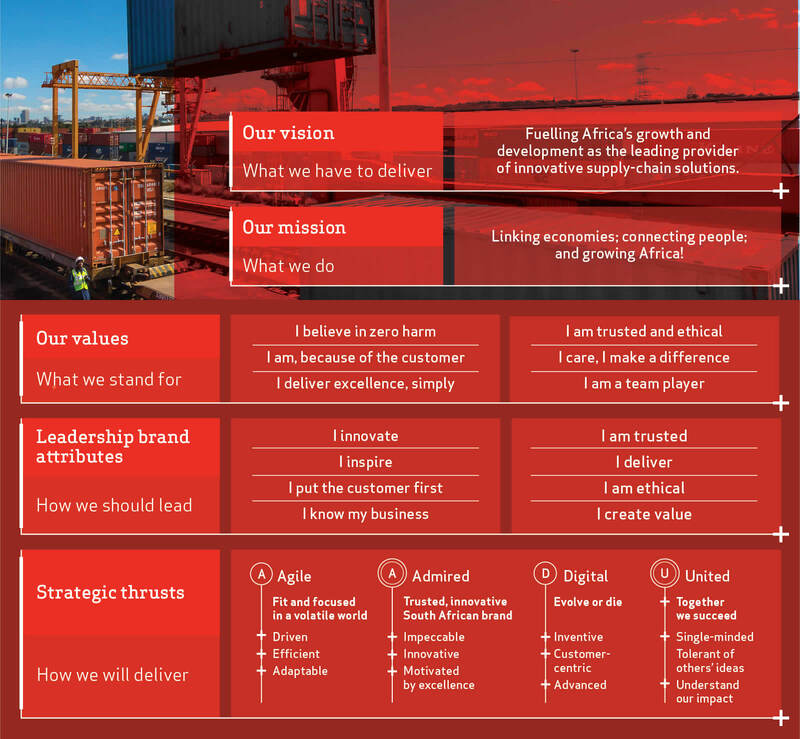 Transnet is transitioning from the Market Demand Strategy (MDS) – first implemented in 2012 – to a new blueprint for growth and diversification, the Transnet 4.0 Strategy (Transnet 4.0). The MDS has largely achieved its objective of closing the market demand capacity gap for freight logistics infrastructure, with approximately R165,6 billion invested in the previous six years. Transnet 4.0 provides a framework for Transnet's growth and diversification within the context of the 4th Industrial Revolution. Expanding Transnet’s advanced manufacturing business, with leading technologies to enhance new and existing products, and improve business processes. Global growth of 3,9% estimated for 2018, with 4,9% growth forecast for developing and emerging markets. Continued strong growth in emerging Asia and Europe, and a modest upswing in commodity exports after three years of weak performance. The International Monetary Fund forecasts South Africa’s economy to grow by 1,5% in 2018, an improvement on the 1,3% growth rate of 2017. Business confidence improved following a period of political uncertainty, with the growth rate set to keep improving beyond 2018. Sub-saharan Africa’s estimated regional growth is 3,4%. Still unclear whether projected improvements in GDP and business confidence will provide sufficient relief from the effects of South Africa’s sovereign credit-rating downgrade in 2017. The new presidential dispensation should help buy growth in private consumption and fixed investment. Higher prices for commodities will sustain growth in mining sector. The 4th Industrial Revolution ushers in a fusion of technologies poised to disrupt every industry, with major economic and technological ramifications and systemic transformation of civil society, production, governance structures and human identity. Transportation and communication costs are likely to reduce, and logistics and global supply chains will become more effective. The cost of trade is rapidly diminishing to drive new markets and economic growth. Transnet’s primary focus remains volume growth of the core business, while seeking new growth paths to compensate for low growth expectations and instability in traditional markets. Organic growth in the current freight transport and handling divisions will account for the bulk of this growth as we improve connectivity, density and capacity of an increasingly integrated port, rail and pipeline network. Strategic private sector partnerships in the freight logistics sector will accelerate new business ventures and new revenue growth. The Company operates in compliance with 200 regulations. Tariffs charged by the National Ports Authority and Pipelines are determined by independent economic regulators, namely the Ports Regulator of South Africa (Ports Regulator) and the National Energy Regulator of South Africa (Nersa) respectively. The Railway Safety Regulator regulates the safety of the rail operations of the Company, issues safety permits (for a fee), and conducts inspections and audits on the Company. Transnet also operates within a policy context determined by the Department of Public Enterprises and the Department of Transport respectively. As a SOC, the financial strategy reflects the higher risk profile of the business. To meet long-term market demand, Transnet invests for long-term growth prospects, but considers short- to medium-term volatility in domestic and international markets. Transnet raises funds in the debt markets based on the strength of its financial position, having raised funding without Government guarantees since March 1999. Funded through reserves and borrowings with no subsidies or guarantees received from Government. Remain within the medium-term target – Gearing <50% and cash interest cover of >2,5 times. Legacy Government-guaranteed debt amounts to R3 500 million comprising Eurorand bonds under the Euro Medium-Term Note Programme maturing in 2028 (R2 000 million) and 2029 (R1 500 million) respectively. Optimising the social and economic impact of all interventions undertaken by the Company in the achievement of these objectives.